Dermatologic surgeons performed nearly 9.5 million medically necessary and cosmetic procedures in 2014, according to survey results released today by the American Society for Dermatologic Surgery. With increases in skin cancer treatments and several cosmetic categories, 2014 totals were 21 percent higher than two years ago but remained steady overall compared to 2013 figures. 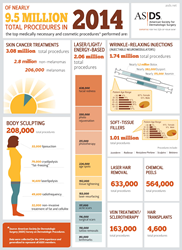 For the fourth year in a row, skin cancer treatments ranked as the most-performed procedure (3.08 million) by ASDS members – confirming both the growing incidence of the disease as well as member expertise of its treatment. Dermatologic surgeons in 2014 also performed 6.4 million cosmetic treatments – ranging from injectable wrinkle-relaxers and soft-tissue fillers to laser/light/energy-based procedures and body sculpting. Laser hair removal continued to rate among the fastest-growing procedures, registering more than 632,000 in 2014 for a 27 percent jump from last year and 51 percent spike since 2012. “Consumers interested in laser hair removal treatments have become increasingly aware that the safest, most effective way to achieve their desired outcome is by seeing a board-certified dermatologist,” Hruza said. 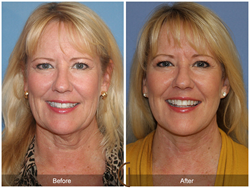 ASDS members are experts in minimally invasive cosmetic treatments that are reflective of consumer concerns. Respondents to the 2015 ASDS Consumer Survey on Cosmetic Dermatologic Procedures indicated for the third year in a row that excess weight is their top cosmetic concern. Body sculpting treatments including cryolipolysis – commonly known as “fat-freezing” – have surged 53 percent since 2012 to 208,000 in 2014. More than half of consumers also reported they are bothered by wrinkles around the eyes and on other areas of the face; skin texture and/or discoloration; and sagging skin. Those concerns are successfully addressed with wrinkle-relaxing injections, soft-tissue fillers, a variety of laser/light devices and chemical peels. As skin cancer rates continue to rise, dermatologic surgeons provide expert diagnosis and treatment while remaining committed to educating the public about prevention methods. Of the 3.08 million skin cancer procedures performed by ASDS members in 2014, 207,000 were for melanoma, a 9 percent increase over 2013. Treatments for non-melanoma also increased slightly. ASDS is at the forefront of researching the best treatments for skin cancer. Earlier this month, an ASDS Board-appointed expert group of dermatologic surgeons released the first-ever consensus recommendations for the treatment and management of basal cell carcinoma, the most frequently occurring form of skin cancer. The ASDS panel agreed that surgical approaches typically provide the best outcomes, with Mohs Micrographic Surgery recommended as the “treatment of choice” – taking into consideration cure rates, recurrence rates, aesthetic and functional outcomes, and cost effectiveness. Data were collected for the 2014 experience and generalized to represent all ASDS members. The survey was conducted Jan. 2 to Feb. 6, 2015, for data reported in 2014. The survey link was sent to 3,980 practicing members. Survey results are reported based on 826 physicians, or a 21 percent response rate.